I just created this meatless sandwich from a few items I brought in to work. When most people think of sandwiches, they think of three core components: meat, cheese and bread. Well, here’s a wonderful alternative for a quick whole foods, plant-based (WFPB) sandwich. 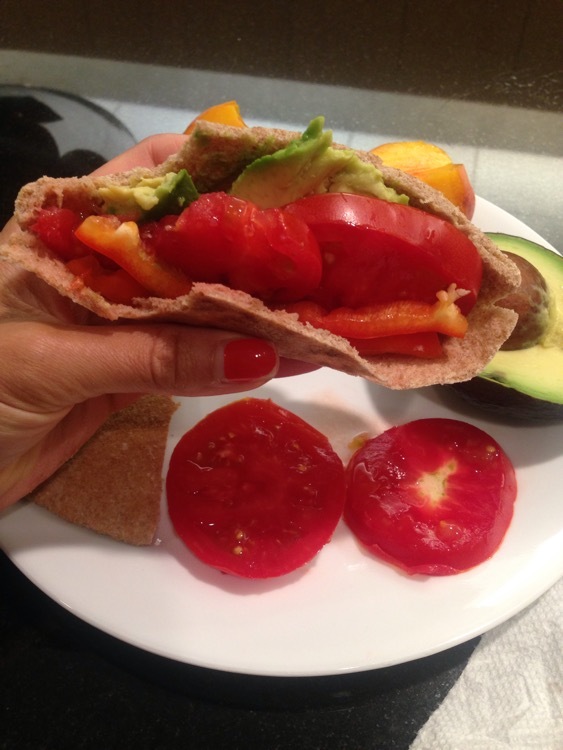 I used a thin whole wheat pita bread which has 60 calories per serving, avocado, tomatoes and red bell peppers. Next time, I could switch it up and have hummus, lettuce, or even use a slice of cabbage, onions or cucumbers. The options are endless with plant-based sandwiches. I’ve always been a fan of bringing a meal from home, and sandwiches are just about the perfect lunch food because they’re portable and have an endless variety of options. According to a national survey, Americans are buying lunch instead of bringing it from home nearly three times per week.